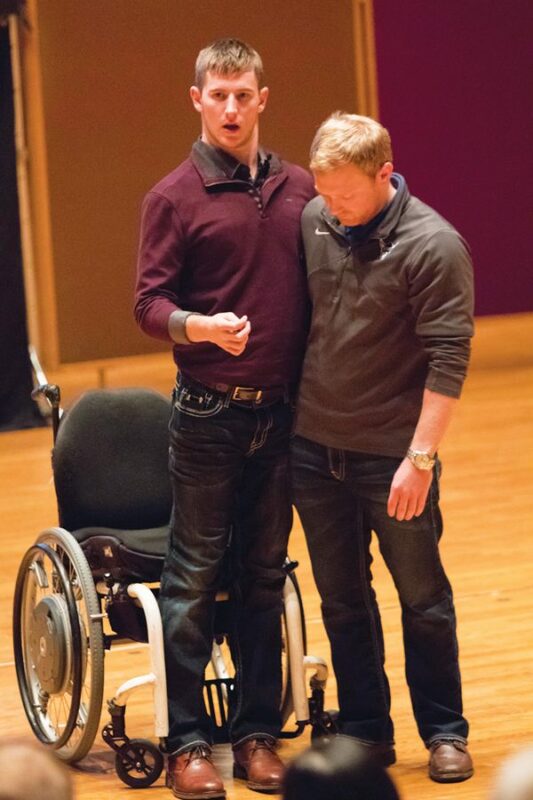 Chris Norton ('15) stands up on stage with help from Alex Peterson. Luther alum and co-author of a memoir Chris Norton (’15) delivered a motivational talk in the Center for Faith and Life (CFL) on Feb. 28. Approximately 200 students, faculty, staff and community members attended the talk. The talk was followed by a question and answer and book-signing sessions. Norton suffered a severe spinal cord injury while playing football during his first year at Luther. Doctors gave him a three percent chance of recovering movement below his neck. However, Norton focused on his physical therapy every day and was able to walk across the graduation stage with help from his fiancée to receive his diploma. A video of Norton’s graduation walk quickly became viral. During his talk, Norton explained that he found purpose in living his life after the football game in which he suffered his injury. According to Norton, part of that purpose is to travel the country delivering motivational talks as well as founding an organization for others who have similar injuries. Throughout his recovery process, Norton co-authored a book with his father titled “The Power of Faith When Tragedy Strikes: A Father-Son Memoir.” After the speech, Norton signed copies of the book and met attendees. During his lecture, Norton discussed the three core principles that helped him get through his recovery: attitude, effort, and purpose. Norton explained that changing his attitude was necessary to achieve his goal of regaining movement. Effort was necessary to continue through his training and he explained that he had found a purpose in inspiring and motivating others. In an interview with Chips, Norton said that although this was not his first time visiting Luther to speak, this was his first time delivering the talk in such a large venue. Norton also said that is was nice to see people he knew. Norton also added that among the familiar faces there were some of his former teammates. Attendee Paige Harris (‘19) said the talk motivated her. Christian Wright (‘18) said the talk influenced him as an athlete. At the end of his talk, Norton took time to recognize the support he continues to receive from the Luther community. Norton said he hopes to continue to give similar talks. Norton is now headed to Birmingham, AL, for a talk with student-athletes.